Last Thursday, I had the fortunate coincidence of being visited by two of my best friends from college, Timothy Johnson and Peter Ngo. They had both been to Boston back in June 2016 to serve as groomsmen in my wedding, but I hadn’t seen them since. Their trips were independent, but happened to overlap on Thursday, which also happened to be the best day for them to visit me and Grace. With both of them visiting, along with Tim’s girlfriend Xiao, Grace and I decided to host them at our apartment and make a whole feast of Indian food. We had just recently learned how to make Chicken Tikka Masala, Palak Paneer, Aloo Gobi, and Chicken Tandoori, and we decided to serve all four to them, employing all three of them in the kitchen chopping vegetables and measuring spices. John Shen, another college friend of ours (and Peter’s host) joined us as well, and he remarked after dinner that he was somewhat surprised that I had gotten excited about cooking. Reflecting, I realized that in the moment, cooking four dishes of Indian food, while more than usual, seemed like just a natural extension of the habits Grace and I had built up over the course of a year. We would actually go on to cook Pad Thai and bake bread for our board game group on Saturday and then turn around and make enchiladas for some of the Et Spiritus journal club team on Sunday. Cooking for three different groups of friends in four nights was certainly beyond our usual pace (and not exactly sustainable), but not by much. It’s worlds from where I was at the beginning of grad school. So how did we get to this point? Let me walk through some of the factors and explain a bit of our philosophy behind cooking and hosting. Growing up, I liked having people over, but hated the chores involved in doing so. It seemed that we always needed to clean the entire house any time someone was coming, a fairly big downside of having a fairly big house. But hosting seemed to be something I yearned for: From a young age, I always envisioned myself eventually becoming a sort of grandfatherly figure to my community wherever I’d end up, sort of like (and probably partially inspired by) the character of Whit in Adventures in Odyssey. I lived on campus at Caltech all four years, which meant a meal plan on weekdays and hence little opportunity to cook for others. I did get opportunities to host homework parties on occasion; fall term sophomore year, my roommate Chris White and I counted that we and our friends had done homework for over 30 classes (iirc) just in our room. When I got to grad school, the meal plan was gone, but I lived in Sidney-Pacific, a graduate dorm with very nice individual spaces and common lounges, but rather limited kitchens and living rooms. I loved living there, but it was not very conducive to having more than one or two people over at a time — more than that, and you’d have to use a floor kitchen/lounge, which was always a hassle to cook at. And without guests to serve, I wasn’t very motivated to learn a bunch of new dishes. Cooking for myself always felt a bit lonely, and it took forever. Naturally, that changed when Grace and I got married and moved from Sidney-Pacific into Eastgate, a married dorm where we have less overall space (500 square feet from 670) but only one bedroom and therefore a larger area in which to host people. Having only one kitchen was nice, too — no more going between our rooms to go get the eggs or skillet. We started cooking together much more frequently. If you were to cook something new, what would it be? For me, I had always thought of the dishes learned from parents. It was cool to learn other people’s parents’ dishes — I really liked first learning to cook Chinese food — but other than that cross-pollination, it seems that most of us just cook whatever we grew up eating. That whole perspective changed for me with a book. In April 2016, Grace and I were in Charlottesville, Virginia, for my cousin’s wedding. While we were hanging around my aunt and uncle’s house the day after, Grace found a cookbook exclusively of 30-minute meals. That sounded attractive, and she quickly found a couple recipes for Pad Thai and Singapore Rice Noodles we could try out. We took pictures of them and started on learning how to make them back in SidPac. Pad Thai isn’t my favorite dish to get at a Thai restaurant, but it’s one I was definitely familiar with. After ordering dishes for an applied math seminar for a year and a half, I’d gotten a good feel for the dishes I liked on the menus of a few different restaurants. The paradigm shift in my mind was that instead of just asking our parents for recipes, we could actually find our favorite dishes to order at restaurants and learn how to make those! 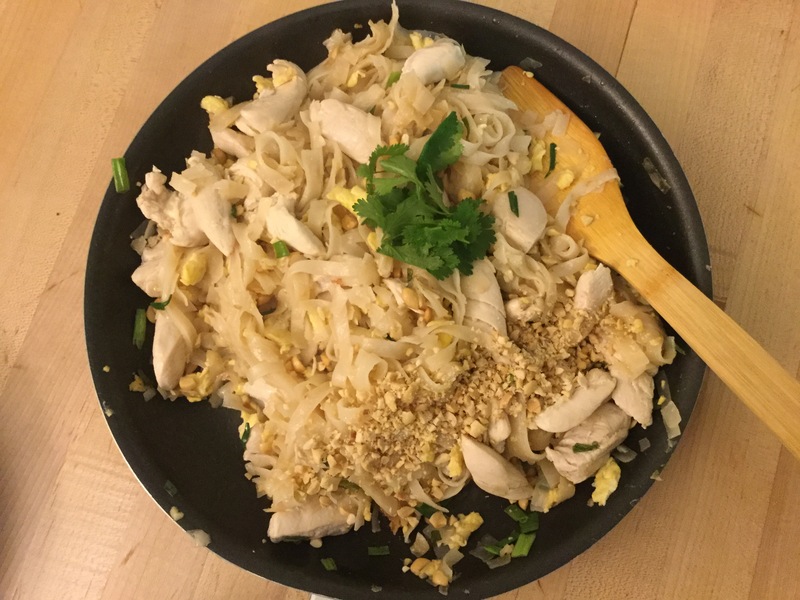 One of our early iterations of Pad Thai, before we realized that honey roasted peanuts made it even tastier. And the Pad Thai from that recipe turned out amazing. With just a couple of iterations to figure out how long to soak the noodles, we had a dish we could serve to guests! Three weeks after moving into Eastgate, we invited Peng and Annie Shi, our best man and matron of honor from our wedding, over for dinner, the first of many guests we’d feed. Next, we went on to Pad See Ew, which is probably my favorite Thai dish. It’s quite convenient that Thai places all over have almost identical menus, so I could actually learn what I liked. We didn’t have a recipe from a book, so we just Googled a few recipes and sort of averaged / simplified them. This one took a few more iterations to get the sauce to taste right — we couldn’t find any kecap manis (sweet soy sauce), but we ended up making it work with a mix of dark soy sauce and Ghirardelli’s caramel sauce like you’d put on ice cream. 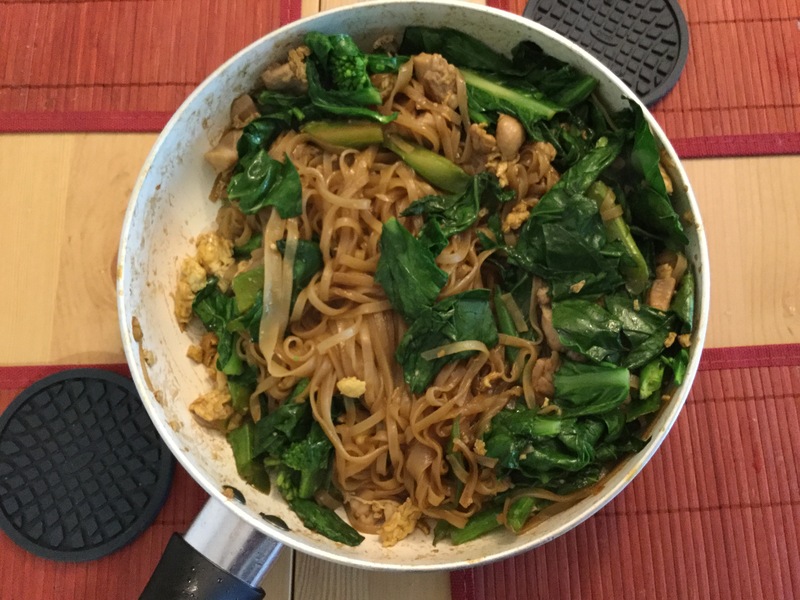 Another early version of our Pad See Ew, before we added carrots and switched to wider noodles. Building up our confidence, we decided to make the Singapore Rice Noodle dish from that recipe as well as a few Singaporean/Malaysian dishes like Char Kway Teow, aiming to learn about one new dish per month. Noodle dishes are all somewhat similar, so we were able to leverage our skills there. Looking up alternative Char Kway Teow recipes actually gave us the idea to try caramel sauce for both that dish and Pad See Ew. Our latest experiment (as of April 2017) is Indian food, and it’s going fantastically so far. The biggest downside to Indian dishes is that they’re often better together; unlike Pad Thai, Chicken Tikka Masala doesn’t make for a very complete meal with just that and rice. The second biggest is that they require a handful of spices that you have to invest in from the get-go. With recipes that we only make every few weeks, it’s easy to forget. I can’t rely on my memory to tell me how much oyster sauce goes in Pad See Ew, and I don’t want to guess and get it wrong half the time. Editing our recipes at each iteration lets us further improve them and make small changes whenever we think something is off. Should the noodles be left to soak for 5 extra minutes? Well, we can change that in the recipe, and then we’ll be sure to do it next time. By learning from recipes that we (mostly) find online, we develop skills and experience that we wouldn’t have had if we just did whatever we felt like doing. By measuring precisely how much we need, we can buy the right amount in the grocery store and not let any go to waste while making a perfect dish. Food waste is a huge problem, as I wrote about in my post on gluttony. We always make sure that everything we buy is used up in either this iteration of the dish or the next (e.g. we use half of a bag of noodles with each batch of Pad Thai or Pad See Ew). The only exception is chicken, which comes in large quantities and which we make sure to freeze if we won’t use it within a day. If someone likes our dish, we can easily send them the recipe with a click of a button. As a matter of practicality, I use Evernote to keep all of the recipes in one place, and editable. As I anticipated, my iPad has been very useful in giving us access to the recipe while at the kitchen table. Once we moved into Eastgate, I looked for every excuse to invite friends over to our apartment. After our IKEA assembly party the day after we moved in, we started inviting every subset of friends over, making excuses for multiple “housewarming” parties. As those excuses dried up, we started to settle into a rhythm. There are only so many evenings in the week, and with 3-5 taken by weekly activities, we needed to be proactive. We started to list the different groups of friends and couples to invite over. With one couple (Po-Ru and Charis Loh), we’d already gotten into a pattern of eating together every few months, switching off between hosting and being hosted. We started to add more to that kind of a rotation, and by now, it’s grown to over a dozen couples or groups. This might sound a little bit formulaic, like we’re just plugging our friends into some kind of machine, and we’re only inviting them over because it’s their “turn.” Sometimes it does even feel that way when getting over the initial activation energy to invite them. But when we do get to see them and catch up over a meal, we’ve been pleasantly surprised at how rewarding it is. Fish Eat Fish, a psychological bluffing game, but with a twist: With John playing as a referee, the cards that were played were hidden, with John indicated the result and nothing more. Colt Express, a programmatic game themed off of a bunch of bandits trying to rob a train in the wild west. Xiao apparently liked the game so much that Tim tells me she wants to get it. Cooking, eating, and playing games with friends has made for some of the most rewarding evenings of married life. It’s a joy to bond over a meal with friends, and then when we run out of things to talk about, break out a game. As we’ve started to give ourselves various options, I’ve been quite curious how much each of these recipes cost per meal. True to form, I put together a Google spreadsheet, recorded receipts, and even window-shopped for the prices of some of the sauces and other less frequent purchases at the grocery stores we usually shop from. How much do you think these dishes cost per person? The average comes in right at $2/person. That’s it. Pad See Ew is even cheaper — $1.30 per person; those vegetables go far, even getting them from H Mart. But even the most expensive, Chicken Tikka Masala, is only $2.74 per person, although we’re still figuring out how to count the servings for Indian food (since we usually eat multiple dishes and have lots of leftovers). Just to put that into perspective, when our plans fell through on occasion early in our time in Eastgate, Grace and I would sometimes get a burrito bowl from Chipotle right outside our apartment. With special loyalty discounts and the cheapest meat, we could get the price down to maybe $6, and then split it between us for our meal. Every single dish we’ve learned to cook is less expensive than that. Naturally, there’s also a time cost involved, something I have made a big deal about other times in grad school, for instance when deciding to Uber/Lyft rather than take the T, even though we live right on top of the Red Line. But going out to eat also takes time, especially at a restaurant. Grace and I still do go out for a date night dinner once every couple months, and the time it takes to get there, order, and wait for the food to be prepared takes about as long as the shopping and cooking often does. Even Chipotle often involves waiting in line. Despite the enthusiasm I’ve shown in this post, I could never cook for every meal of the day; that would be exhausting. Possibly ironically, although entirely how I envisioned it, one big key to maintaining this pace has been Soylent. Since writing about it on my blog over two years ago, I’ve settled into a rhythm of drinking a bottle or two of Soylent 2.0 for every breakfast or lunch that isn’t free. (When I have it for both breakfast and lunch, I often have one Original when I wake up, then one Cacao around noon, then a second Original around 3pm.) But rather than decreasing my appetite and patience for food like the most apocalyptic predictions on both sides would have predicted, it’s given me that time and space back to focus on making tasty food for dinner. Soylent is about 2-3 times more expensive than home-cooked meals, assuming dinner corresponds to about two bottles of Soylent. But the combination is more than the sum of its parts: By spending just a little more money on Soylent, I save more time, planning capacity, and space in my backpack that I can then spend on a really tasty dinner every day. And having that tasty but cheap dinner to look forward to keeps costs lower and makes my meals of Soylent all that more palatable. Nearly all of my real meals are tasty, and I only have to spend time cooking once per day. Since you’re probably wondering, Grace also drinks Soylent, although not as much as I do. For lunches, she typically eats leftovers or makes ramen (not the cheapest kind), her favorite type of food by far. She sometimes has cereal and sometimes has Soylent for breakfasts, leaving dinners for us to eat together. As I’ve learned from friends who worked there, in a restaurant kitchen, there are two types of jobs: chefs and cooks. Chefs do all the hard work of experimenting and dreaming up new recipes, while cooks simply make things the same prescribed way every single time. Naturally, most restaurants only need one chef and a lot of cooks. I used to think of cooking as being a chef, like you needed some extensive underlying base of knowledge that you’d only get through years of practice. But it’s really much more like being, well, a cook: You just have to do what the recipe tells you to do. If you’re learning for the first time, there are endless resources and videos on the internet that can teach you the best way to do whatever task the recipe calls for. If you have a kitchen and want to cook tasty food like you get in restaurants for a tiny fraction of the price, you totally can — just do it.